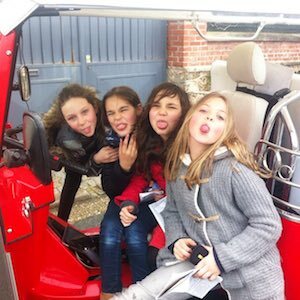 A great Thing to do in Paris with Kids : hop-on aboard our 6-seaters tuktuk ! Kids love our tuktuks ! 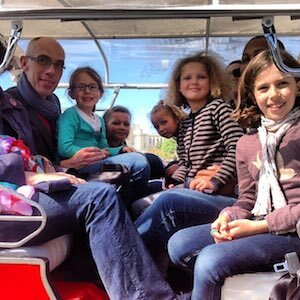 It is a fun and original way to discover Paris as a family ! Believe us your kids will have a really great time with us, just take a look at ourkids picture galery. WHAT TO DO IN PARIS AS A FAMILY ? We have designed more than 10 original Tours,all you have to do now is pick your favorite ! 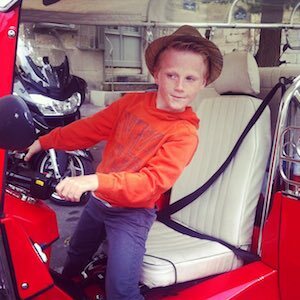 Our experience shows that kids prefer the classical tours that go throw the most famous landmarks Paris has to offer. It is free for the first kid under 12 years old! And it is free for ALL kids under 5 years of age ! Please refer to our price grid and subtract from your number of passengers the first kid under 12, and all kids under 5 ! Our tuktuks can accommodate up to 6 passengers and therefore are suited to large families. If you are lucky enough to be an even larger group, we can provide a second or third electric tuktuk with chauffeurs ! A Tour of Paris in a tuktuk is an activity that kids love : out in the fresh air (although protected from the cold weather with a full-body cover when it is cold in the winter), our tours promises to wow them with a full spectrum of sensations and a feeling of liberty and Paris will of course impress them very much !